The king's daughter is all glorious within: her clothing is of wrought gold. She shall be brought unto the king in raiment of needlework: the virgins her companions that follow her shall be brought unto thee. A philosophically minded person might ask the question 'If God is cause what is effect?' Those of us who are more simply minded are might ask 'If God is cause what is His effect on me?' It was, I think, because faithful Christians were seeking an answer to this second question that they began to look upon the person of Mary the mother of Jesus. If we wish to learn what sort of impact having a direct personal relationship with God could or should have upon us it is natural enough for us to look first of all at those who have preceded us in the faith. We can deduce from them what is likely to be the case for ourselves.First to appear before the eyes of the faithful were the Apostles and still today we can learn much from them through the pages of Scripture. After them were many saints of the Church, male and female, in whom God as effect shines through in the transformations wrought in their lives and the courage with which they gave witness to their faith. Following the principle of 'think universal, act local' we should try to see God as effect in the Christians nearest at hand to us, perhaps within our families, perhaps within our communities. One deduction we should be able to make from this cloud of witnesses is that having a relationship with God can have a profound, thoroughgoing and lasting effect on human lives. Another deduction would be that this effect is not uniform in nature, it is different in kind and degree in each individual depending upon that persons character and the closeness of their friendship with the Father, through the Son in the power of the Holy Spirit. Given that relationships are different in degree it follows that out of all the actual relationships that exist there must be one which is closer, more perfect and more profound than all the rest. To answer the question 'if God is cause what is His effect on me?' it will help us to know who it is that is most effected by Him so that we can learn from that person and through following their example come closer ourselves to God. If we consider the question of who is most effected purely in relation to God incarnated in the person of Jesus then a number of different answers might be proposed. Apart from His mother we could consider the claims of the Beloved Disciple mentioned in the Gospel according to St John (probably the Evangelist himself) or those of St Mary Magdalene the first witness to the resurrection and Apostle to the Apostles (although claims that she was married to our Lord can be dismissed as fanciful at best.) 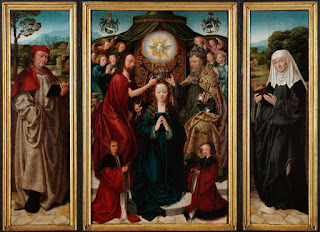 However, if we consider the question in relation to the Triune God then there can be no doubt at all that the answer will be the Blessed Virgin Mary. The formula in which this is expressed is that Mary is daughter of the Father, mother of the Son, spouse of the Holy Spirit. This is a formulation which is both accurate and necessary but it is most useful for the philosophically minded people whom I mentioned earlier. Is there a more, as it were, human way of describing the relationship which will help us to answer our query about God's effect on me? When I reflect upon Mary I think upon her friendship with God like this- she is (that is she exists) and she is beloved and loving through her relationship with the Father, she is fruitful and loving through her relationship with the Holy Spirit, she encounters God and expresses love in this world through the Son. No human is more beloved by the Father than Mary, none are more fruitful by the Holy Spirit than is Mary and none are more intimately involved in the entirety of the human life of the Son than Mary. The Blessed Trinity is the cause, the entire life of our Lady is the effect. She stands before us as an exemplar,the model of perfection. Through her relationship she experienced the greatest of all possible human joys, to be the mother of the Son of God, and the greatest of all possible human sorrows, to be the mother of the crucified Christ, and the greatest of all possible gifts, she received her Son back from the dead. She was at the centre of human history, she lived a life of deepest obscurity in a little Galilean town. She was patient, before the Annunciation, she was active, in the Visitation, she was a woman of prayer, she was a mother to the Beloved Disciple. If it is true we cannot experience these effects to the same degree as our Lady it is also true that we can experience all of them to some extent. The more we resist grace the less like Mary we will be, the more we co-operate with its effects the more we will mirror her who is the mirror of perfection. Here I propose another formula- like Mary we can wait upon the Father, become fruitful through the Spirit, accompany the Son. We should remember too that to be with the Son is to also be with the Apostles, the sick, the outcast and the poor. The effect of God on me is never just a private matter, love exists to be shared, it cannot be a solitary concern, and to grow, love diminished is love dying. Mary joyfully accepted the vocation to be the mother of God not only because it promised to bring her closer to the Lord but because through Him the whole world could be liberated from the chains which bound it. One answer to the philosophical question 'if God is cause what is effect?' is 'selfless love.' For philosophers and the simple alike Mary offers a key which helps us to understand God's purposes for us. Let us give her our undivided attention and through her we will come to know and love the Blessed Trinity. Follow @stevhep on Twitter, Google+ and Tumblr, follow Catholic Scot on Pinterest.